Carzonrent India’s EasyCabs Mobile Application suite has been updated today with two new important and useful features. The new update now enables customers to track the location of their booked cabs which is real-time monitoring of cabs and will also have the option of getting live traffic information once they book a car on the Easycabs Mobile Application. With Real Time monitoring of cabs booked via the mobile application, the customers can now monitor the location of their cabs on real time basis. 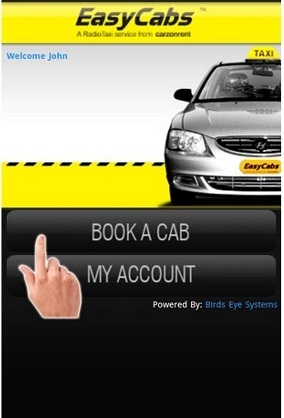 Easycabs customers can track the location of the cab once it has been assigned through the Mobile booking application. Customers won’t have to bother for any follow-up calls, with the app they will know the exact location of the cab and when will it be reaching the pickup location. The live updates on traffic which is powered by Traffline.com will facilitate the Easycabs customer with the traffic situation on their way enabling them to sketch out a different route to surpass the traffic. You can download the app for Android over here, BlackBerry over here, and Nokia over here.The EasyCabs mobile application feature is available for service to customers in Delhi-NCR, Mumbai, Hyderabad and Bengaluru.